On January 21, 2015, the Niagara County Sheriff’s office responded to a report of an explosion at the house of Chair of the Niagara County Legislature, William Ross. They discovered that his step-son, former corrections officer Michael O’Neill, who lived with his mother and step-father at the house, had blown off his leg while working with explosives in the garage. 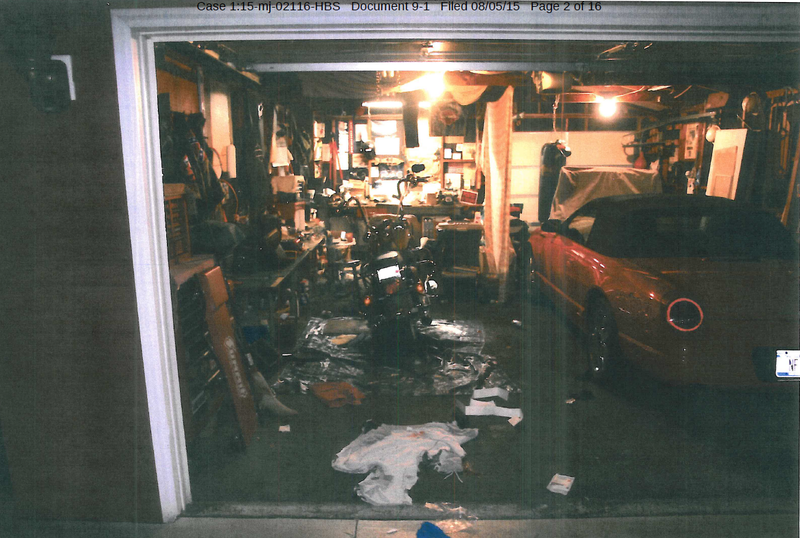 In addition to the one that exploded, there were 6 completed Improvised Explosive Devices in the garage, along with shrapnel, fireworks powder, and other explosives precursors. The complaint made no mention of any evidence beyond the explosives precursors. O’Neill was brought to a local hospital where he had his leg amputated. When an ATF and Sheriff’s investigator interviewed O’Neill at the hospital, he claimed he had been making the bombs to blow up tree stumps. A week later, on July 29, also in the Buffalo area, FBI Agent Amanda Pike arrested US citizen Lackawanna resident Arafat Nagi on charges of attempting to materially support ISIS. The complaint laying out the case against Nagi relied on trips to Turkey and Yemen (Nagi has family in the latter), a slew of tweets supporting ISIS, and some 2012 and 2013 purchases of military equipment — including body armor and a machete — and Islamic flags from eBay. The complaint also included pictures Nagi had tweeted out depicting ISIS and extremist flags and Abu Bakr al-Baghdadi. The most recent event cited in the complaint was a February 28, 2015 conversation (apparently not taped) between Nagi and an associate who — given the redaction of a descriptive footnote — almost certainly either has a criminal record or is working off some arrest, in which Nagi said he’d use insurance money to travel to Syria. The associate — not Nagi — raised meeting with al-Baghdadi (presumed to be Abu Bakr al-Baghdadi). In spite of the silence about any precipitating event that led to Nagi’s arrest in July, the US Attorney for Western New York (and the husband of Lieutenant Governor Kathy Hochul), William Hochul, had a press conference to announce Nagi’s arrest. Both court documents and public reporting indicated that the Muslim community had tipped authorities off to Nagi’s increasing belligerence in support of radical views. On July 27, Magistrate Hugh Scott had a hearing on O’Neill’s custody. In spite of the government’s request, Scott did not place O’Neill in US Marshal custody right away, in part so his mother could visit him more easily. On July 30, Magistrate Scott again deferred his decision on custody to receive briefing. On August 5, Scott held a third hearing on O’Neill’s detention. O’Neill’s attorney argued that his 7 IEDs did not constitute bombs at all (remember, he said he was going to attack tree stumps with them). The government said they were, pointing to the shrapnel in one of the constructed bombs. The judge agreed, noting “there is no non-malevolent explanation for why that explosive powder needed to contain or to be associated with nails and other shrapnel.” Unlike in Nagi’s detention consideration, Scott did not mention his prior violence, such as the bar fight a year ago that was precipitated when O’Neill used a racial slur in response to a request for a lighter. If I’m reading the docket correctly, after a recess in this Wednesday hearing, Scott issued his written opinion. Only then did the parties proffer new evidence. His defense shows that a number of DWUI charges (one of which resulted in him losing his gun permit in 2010,which in turn referenced earlier alcohol issues recorded by his work, presumably, the corrections facility where he used to work) had been resolved with no jail time. But only then — after the judge had already decided to hold O’Neill because he put BBs and nails in his IEDs — did the government introduce this evidence, evidence that had to have been apparent (and probably was collected) when the ATF and Sheriff’s investigator did their initial investigation of what O’Neill had been doing in the garage owned by the Chair of the County Legislature. 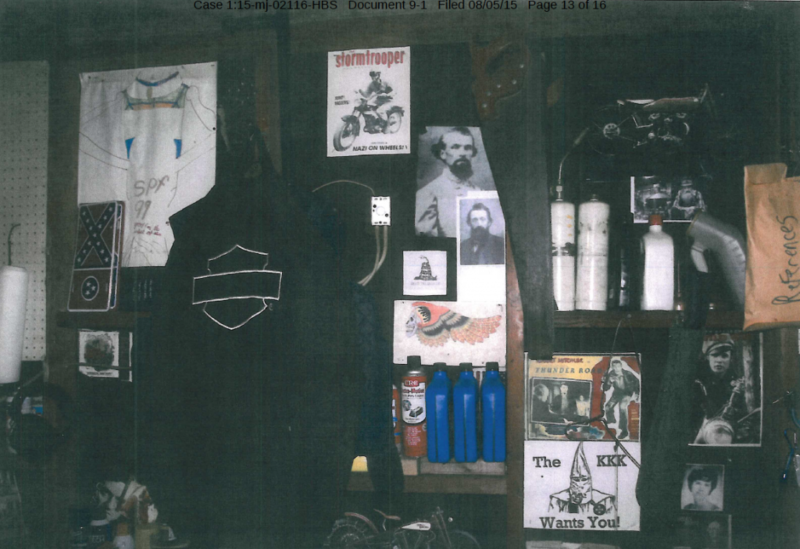 That evidence shows that the work bench at which Ross’ step-son was emptying fireworks for powder and adding nails to IEDs was decorated with a Stormtrooper poster, a picture of Nathan Bedford Forrest, a Confederate flag, and a poster advertising, “The KKK wants you.” O’Neill also appears to have had a sword (most visible in Exhibit 14) not mentioned in any legal document. I don’t fault Scott that he didn’t mention the evidence that O’Neill was constructing bombs amid a bunch of white supremacist propaganda — he hadn’t been shown it or apparently even informed of it until he issued his opinion. But I find it notable that the prosecutors — and Hochul, who held a press conference upon the arrest of a guy who hadn’t done anything incriminating (at least according to the complaint) since February — didn’t mention this until this stage of the proceedings. And while Hochul commented publicly to the press, I don’t believe he had a formal press conference to highlight the guy making 7 bombs in his step-dad’s garage did so under the glare of the first Klan Grand Wizard. O’Neill’s politically connected step-father, in whose garage he was assembling bombs right below Nazi and Klan paraphernalia, said “he didn’t know what O’Neill was doing and if he did, he would have alerted authorities,” which appears to make him far less attentive than the Muslims who reported Nagi’s belligerence. Judge Scott expressed some skepticism that Ross could miss both the explosives construction and the Nazi propaganda in clear view in his garage. The US Attorney’s office says it is investigating O’Neill’s devices to see if they can determine where he learned to build the IEDs and whether they can determine precisely what “stumps” he had in mind for a target. Notably, these IEDs are probably powerful enough the government could charge O’Neill with possession of WMD, which carries a terrorist enhancement, if they discover he had plans of using those IEDs to terrorize. Since Nagi’s arrest, a number of commentators — including this post and a paragraph of this excellent Ryan Reilly piece — place this case among those where someone is accused of terrorism exclusively for speech. The bulk of the evidence in this case, aside from two trips to Turkey during which Nagi didn’t join ISIS, amounts to speech, albeit clearly hateful speech. We don’t yet know whether O’Neill has engaged in similar public hate speech (aside from the racist comment last summer that seems to have gotten him hospitalized); what has been mentioned so far is dead tree propaganda, nothing that would reflect interaction with others (his neighbors, at least, had no idea what he was doing in the garage at all hours of the night). Moreover, there is the added (inexcusable but predictable) factor that this guy was the step-son of a politically connected guy, which would lead prosecutors to exercise some caution about crying terrorism without a good deal of evidence.